How many times it happened to you that you read a joke, have a little laugh, and then forward it to someone else. Now you go through all those old jokes, re-read them, laugh again and in addition, forward that joke to some more people. But, if I ask you, what these jokes are all about? You may answer, they are for fun, what else. You are not wrong. Jokes are here for a laugh and to share a lighter moment or two with friends and family. But having say that they are here for something more than that. Something that we unconsciously ignore in our laughs. The Hidden Knowledge. Remember Mullah Nassurudin, Akbar-Birbal or any other short stories, something that you have once read in newspaper’s joke section and now on WhatsApp. The joke is clearly about man’s foolishness and you might be still laughing at that joke. But there is something about this joke, something that you will only find when you will apply your brain to the joke. Something that I have mentioned before telling you the joke, the hidden knowledge. Indeed, the joke is about husband and wife relationship, but it is also about false egos and prejudice. We are stuck with our own perspectives and opinions. Moreover, we never agree on the fact that we could be wrong and others could be right. There could be a different way to see a problem. We ignore the fact that the world is a reflection of what we are now, I mean if we think ill of others, others will do the same. 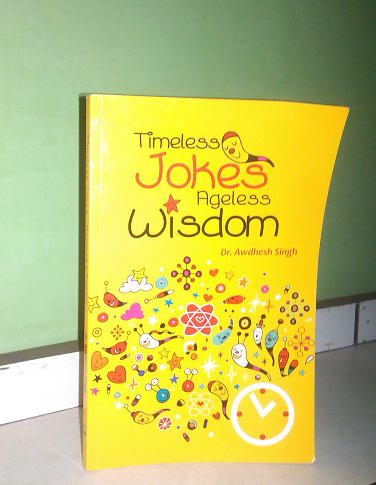 The book, Timeless Jokes Ageless Wisdom by Dr. Awdhesh Singh is about such timeless jokes and their hidden knowledge. The book contains stories of Mullah Naseeruddin, Akbar Birbal, and WhatsApp. Having said that, what is incredible about this book, how the author has pointed out the hidden messages in these jokes. The above joke (with little moderation) is also taken from this book and if you love that joke, the book is full of such jokes and short stories. I love to read stories. I am excited to read this book also. I will definitely buy this book and will give you feedback about it. Many thanks for reading my book and posting a nice review on your blog. I hope you enjoyed reading it. Dr. Diana, please read my book and post your review also.